During the ancient Hindu times, there existed powerful weapons that were so powerful that it had more destructive force than the advanced nuclear weapons. Believe it or not, but there were weapons that could annihilate the whole universe. In the Mahabharata and Ramayana, Brahmastra is the most popular weapon and most significantly written weapon, in that it is evident in various scriptures as well. This weapon can only be used once in a lifetime and could do severe damages. Rama intended to use this against Sagar when he wanted the Sagar to give way to Lanka. He resorted to Brahmastra when Sagar was not changing his mind. Sagar agreed immediately when he saw the Brahmastra, and since Brahmastra was already invoked, Rama had to direct it to some other place that so that the destruction would be limited. Rama also used Prasvapna. Ravana was immortal and because of Amrita, he was not dying. Rama used Prasvapana to evaporate that Amrita so that he could kill him. Vibheeshana had guided Rama about this weapon. Moreover, he used Gandharvastra to kill 14,000 asuras. What this weapon did was it mentally twisted asuras mind that they thought the person next to them was Rama, and thus, they fought with each other and ultimately ended up killing each other. Only Rama and Ravana had the knowledge about this weapon. However, Rama also knew how to neutralize this, while Ravana didn’t. When Rama was a student, he used Manavastra on Maricha. 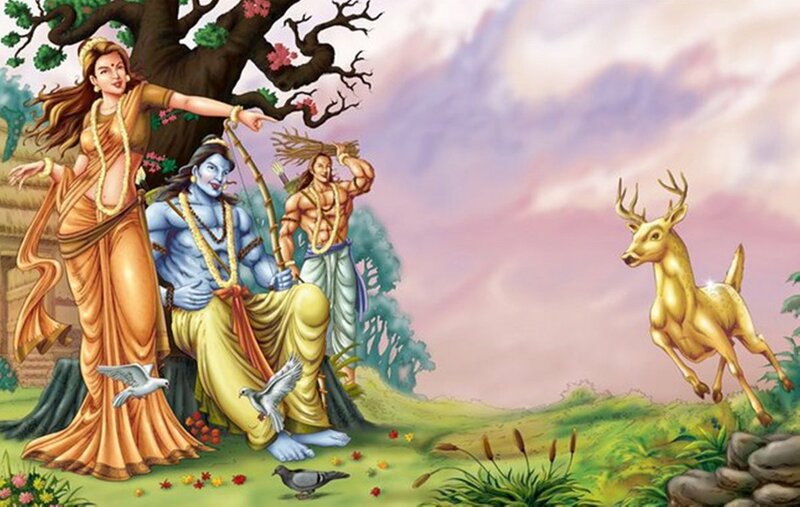 Maricha assumed the form of a golden deer and helped Ravana kidnap Sita. Lakshman was a master of different weapons. He used Varunaastra while attacking Meghnad, the son of Ravana. But it failed. When Meghnad used Aagneyastra, Lakshman used Sauryaastra to neutralize it. When Meghnad used the Asur weapon, Lakshman used the powerful Maheshwar as a weapon. Only when Lakshman used Indrastra he was successful to annihilate Meghnad. However, Meghnad had used Shakti, a powerful weapon, during the battle that left Lakshman unconscious. Hanuman brought Sanjeevani to revive him. In Naagpaash, Meghnad imprisoned both Rama and Lakshman. Hanuman had to resort to Garud when nobody could free Rama and Lakshman. This incident is a very important teaching in Hindu dharma, as it says that even if you are a teacher, you need to stay humble, just as anyone might need help – even the gods. Here is a small story about the use of weapons in Ramayana. Meghnad had a boon that he couldn’t be killed after performing a yagya. Vibheeshan told about this fact to Rama and ordered Rama, Lakshman, and Hanuman to stop this yagya. There had been a condition that Meghnad couldn’t touch any weapon while he was performing the yagya. To take this advantage and make the most out of the situation, Lakshman, Hanuman, and Rama went to disturb the yagya. Seeing this, he was pissed off with his uncle, Vibheesan who had betrayed him. So he used Yamastra, a divine Astra which he had saved to kill him. But Lakshman neutralized it. Meghnad used all the three fierce Astra – Brahmastra, Pashupatastra, and Vaishnavastra at Lakshman, but nothing even touched Lakshman. When he failed, Meghnad realized that Lakshman was no ordinary man. Meghnad disappeared from the battle and came to his father Ravana and asked him to make a truce with Rama. Ravana labeled him as a coward. Meghnad bid farewell to his parents and came to the battlefield again. He was then killed by Lakshman with Indrastra ultimately in the end.